Last week I had the honor to travel to Aurora, New York on a press trip for MacKenzie-Childs with some of my lovely fellow bloggers and the nicest PR agency ever, the Little Voice Public Relations! If you follow me on Instagram, you know what I’m talking about and was able to follow along with all the fun! It was an unforgettable time of getting to know this fascinating, unique brand. Making new friends and hanging out with old ones, laughing, relaxing, and being thankful. Let’s start by introducing my travel companions! I had the pleasure to travel along with Ali Stone, Kathleen Post, Sabrina Tan, Aylin, Liz Adams, and Cathy Williamson. We were hosted at the lovely Rowland House, which is part of the Inns of Aurora. “Constructed on the shore of Cayuga Lake by Alonzo Morgan Zabriskie in 1903, Rowland House is encompassed by ancient trees, a historic Grecian temple, and a spectacular two-story boathouse. Upon arrival, we had time to rest and eat lunch before heading on to a tour of the Inns. They constitute of 4 luxury properties restored by Pleasant Rowland (former owner of the company and creator of American Dolls). Room 8 is painted walls to ceiling in courtly check by a MacKenzie-Childs artist! Next house was the E.B. Morgan House. “Once the private residence of Colonel Edwin Barber Morgan, co-founder of the New York Times and American Express, E.B. 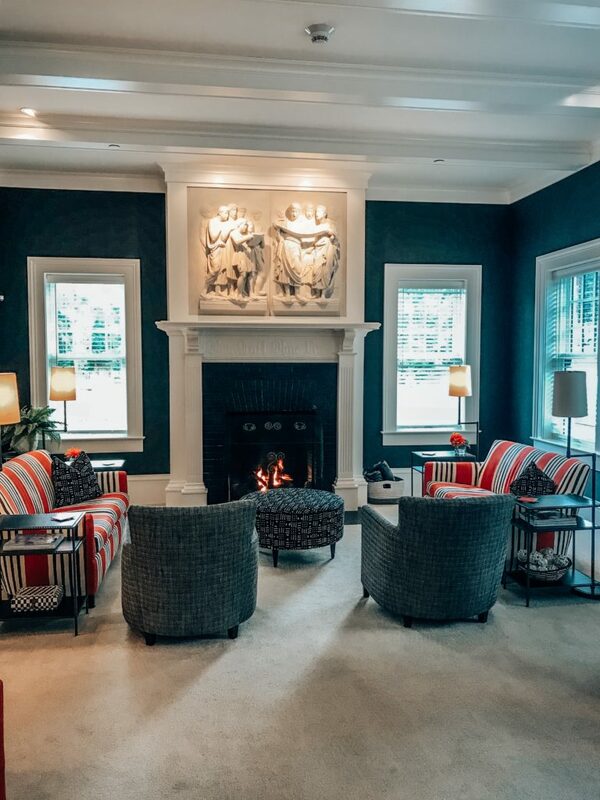 Morgan House combines luxurious modern aesthetics with the unparalleled beauty of a historic stone mansion. Event he staff kitchen has Mackenzie-Childs touches all over! Further down the street is the Wallcourt Hall. “It was built in the heart of Aurora in 1909 for Miss Goldsmith’s School for Girls, a well-respected preparatory school. It later served as a dormitory for Wells College, and, for a brief time, as a studio for MacKenzie-Childs, maker of distinctive and whimsical tableware and home décor. Today, Wallcourt Hall welcomes guests with striking modern style. Its 16 guestrooms offer designer details, with custom furniture, Italian fabrics, and exceptional modern art.” – Inns of Aurora. After the tour of the Inns, we went on a Boat ride along the Cayuga Lake with everyone! We chatted and got to know each other over lots of yummy cheese, charcuterie goodies, and some delish vino!! And we missed the massive storm that was forming on the lake, so we can safely say it was an incredibly successful boat ride! This camp was focused on Holiday Traditions and themes. So the first evening we had a Halloween themed dinner at the Fargo Moose Room (where it all started for MacKenzie-Childs). I was first exposed to MacKenzie-Childs when I worked at Saks Fifth Avenue and I was head over heels with their iconic Courtly Check pattern. Little did I know there’s so much more to the brand than that. And just like so many of you, who reached out during our camp saying you appreciate the brand so much more. I have to say I do too. And I had no idea how many items are still handmade and hand painted in house. My love for this imaginative and whimsical designs grew by the minute while touring the MacKenzie-Childs Headquarters and Farm House. Here’s how it all went. If you need video action, head on to my Insta MacKenzie-Childs Highlights! The pieces are made, pressed, coated with wax, hand painted, baked and passed by a quality control specialist! They have many artists working there and painting the pieces free handed. I have to tell you, we also got to paint a couple pieces. I can’t wait to receive them to show you guys! You’d be surprised how good we actually did!! These are some examples of “guys” who didn’t make the final cut…I’ll take them!! To finalize our tour we stopped by the upholstery and furniture floors. After the tour of the Headquarters, we went on a tour of the MacKenzie-Childs farmhouse. Think dollhouse comes to life!!! It was an explosion of cuteness all in one property!! Starting on the lower level, this is the living room and dining room across the hallway. Table set for the perfect lunch. Following the Holiday traditions theme, we had a table decorated for Thanksgiving. The breakfast room. Anyone else obsessed with the hand painted pumpkins and squashes?! I want them all!! And the dream dollhouse kitchen. On the way upstairs, there was the grandfather’s clock. And a kitchen in a cupboard on top of the stairs! And here are a couple shots of the multiple unique suites from the farmhouse! Once done we headed to the MacKenzie-Childs store to pick our favorite pieces to put together a plate set holiday inspired to share on a Facebook live the next day. Later that afternoon we headed to the Heart & Hands Wine Company for a wine tasting with all the girls! After wine tasting, we went to our fancy dinner night at the Aurora Inn, the 4th property of the Inns of Aurora. And had a delicious meal at the Aurora Inn Dining Room. How marvelous are these visuals?! Soooo MacKenzie-Childs!! The next day after breakfast we had a tour of the farm animals and the outdoor space, the garden and all! We ended our day with a cozy evening of letter pressing gift tags, painting ornaments and had a tea leaf reading over finger foods, sandwiches, and vino galore! The theme for the table set that evening was Christmas! It was the perfect end to An Unforgettable MacKenzie Childs New York Trip. I hope this inspired you to create and have fun with your kitchen pieces and table sets! Stay tuned for an outfit roundup and how to pack for a short trip post coming soon, along with my holiday traditions MacKenzie-Childs style! Loving this Mackenzie Childs New York trip? Click here now for more of my awesome travels!